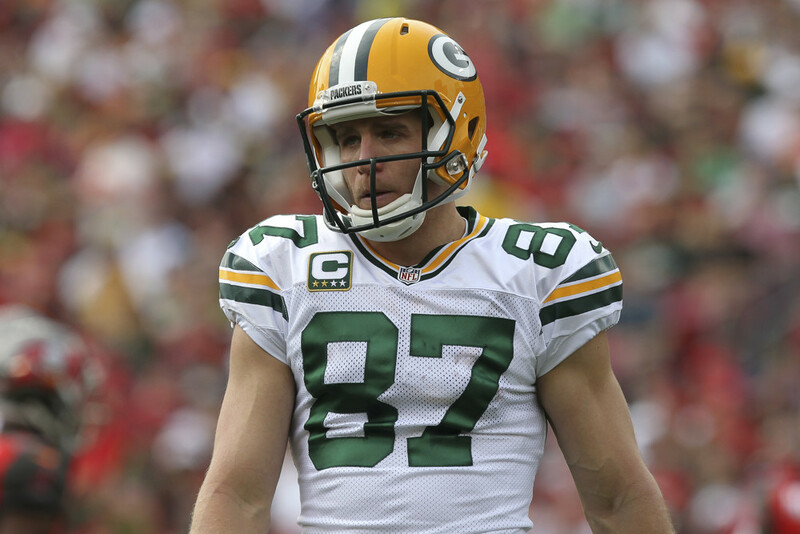 Is Jordy Nelson's fantasy football consistency taken for granted? There were some questions about how Green Bay Packers’ star wide receiver Jordy Nelson would return from his torn ACL injury he suffered last year during the preseason. Nelson answered those questions and then some, as he was recently awarded the ESPYS Comeback Player of the Year, hauling in 97 receptions for 1,257 yards and scoring 14 touchdowns (league high). Nelson finished the year ranked 2nd in wide receiver rankings in both Standard and PPR leagues. Although he finished second, he began the year with a slow start –through the first 7 weeks he ranked 23rd in Standard leagues and 30th in PPR. From week 8 on, with no running game in sight and Aaron Rodgers locking onto him (finishing with a career high 152 targets), he led all receivers in both scoring formats in total fantasy points scored. Nelson has a current ADP of 2.02, and is currently the 6th wide receiver being drafted. The graph below shows his stability in fantasy football ADP over the past month. Data is from 12-team standard mock drafts. 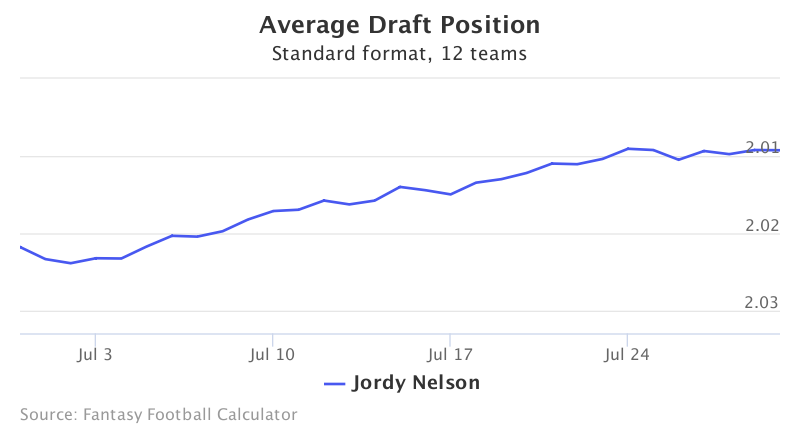 Nelson’s ADP has fluctuated only one spot since a month ago and you can remain certain his ADP, baring any fluke injury, will remain put leading into drafts. Nelson did see career high in targets last year and this is almost certain to go down due to them establishing Ty Montgomery and Jamaal Williams as the year goes on. Green Bay was second in the league last year in passing play percentage with 64.68% - this is surely to come down as they establish above players. If anyone is to suffer, it will most likely be the other wide outs: Randall Cobb or Davante Adams. In Nelson's last 5 seasons in which he's played, he caught over 1,200 yards in four of five seasons, and averages 11 touchdowns per year, which includes 2012, a year where he missed 4 games and "only" scored 7 touchdowns. Nelson was targeted on 27.6% of passing plays instead the 20-yard line, ranking him 8th in the league and saw 31.9% of passing plays within the 10-yard line which ranked him 6th. Inside the 10-yard line last season, Nelson led the league in targets (15), receptions (11) and touchdowns (9). When Green Bay is near the goal line, you can count on the ball going in his direction. You want your first and second round picks to be consistent, high-floor players, and Nelson delivers this, year in and year out. Nelson has shown his injury has not slowed him down, and returns good value at his current ADP come August as he should finish as a top five wide receiver at season's end once again.